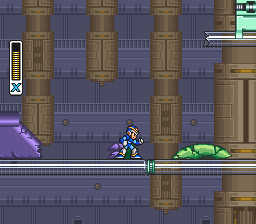 Mega Man X is the first game in the spinoff sequel of Capcom's successful Mega Man franchise. Similar to the classic Mega Man games, this one is also an action/platformer game in which your objective is to clear each stage and reach the final boss. Designed from ground up for the SNES, though, this game has quite a lot new features that will be defining this new franchise. The game presents us with almost no story when starting up, just a few bits to leave the rest of the plot to be revealed during gameplay (or the backstory through the instruction booklet) . 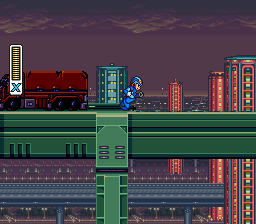 The game takes place a some years after the classic Mega Man series. You play as Mega Man X, better known as simply X, who is the last creation of Dr. Light and is found and activated by Dr. Cain. Through X, Dr. Cain was able to create a new type of robots, called reploids. Unfortunately, some of the reploids start acting up and causing destruction around the world. As part of the Maverick Hunters, it is your job to stop these reploids. The game is really easy to control, specially at the start of it when you don't have any extra abilities unlocked yet. You have the Control Pad which controls your basic directions to go either left or right or climb up ladders. 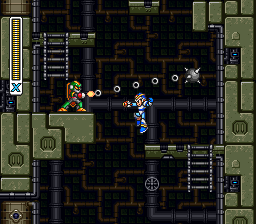 Similar to the classic Mega Man series, there is no crouching here too. You also have a button for shooting and jumping, and then later one for dashing and two for scrolling between weapons. It's worth mentioning that all the button inputs are customizable, so even though the default layout is good enough, you can switch the buttons to however you like. The controls feel really tight and responsive as the game reacts immediately as soon as you press a button. You can easily move through stages and dodge enemy attacks thanks to how good the controls feel. 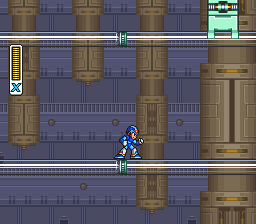 The basic structure of the game is really similar to the old Mega Man games but with certain nice additions. One thing you'll notice first is that they have now added an opening stage. This helps you familiarize yourself with the game and the controls. After this stage, we get the familiar stage selection screen. 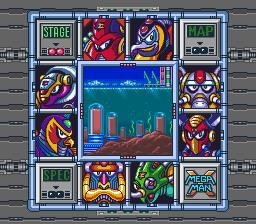 Again, like the classic Mega Man series, you have to go through eight stages and defeat the boss on each stage. You are also able to select the stage to play in any order you want. The stages are all really well designed and providing different types of gameplay and challenges for the genre of the game. Each stage is set in a different place, for example, under the sea, in a forest, or inside a factory. An example of the gameplay variety is featured in the sea level, as the gravity while under water is affected, so your falling speed will be slower and your jumps will be stronger. Something new in the levels of this game compared to the classic series is the fact that certain stages will actually change depending on other stages you've cleared. This basically means that for some of the stages, there's actually two versions of them. So this could mean that the challenge may become easier in some parts but harder in others, although usually it's the first. Beating each of these bosses will grant you a new weapon to use. After beating the usual eight stages, you'll be able to reach the last stages of the game in Sigma's Fortress. These stages offer a higher challenge, new bosses, and will put your abilities to test while still featuring great level design. Another new feature of the game is the introduction of Armor Upgrades. There are 4 armor parts which you can get throughout the game, each of them hidden in different stages in the form of capsules. The upgrades offered by these will help you in different ways. For example, as I mentioned earlier, one of the upgrades you obtain is the ability to dash. Dashing is something that will make the game faster-paced and feel really different than the original Mega Man games. It gives you more variety in the form you can play the game while still retaining the basic principles of the gameplay. Other upgrades can also make your buster charge stronger or help you open up secret places. There's also two other type of upgrades you can get in the game. The first one is the Heart Tank that lets you upgrade your life energy. There's one hidden in each of the regular stages. The other hidden upgrade you can find are the Sub Tanks. There's four of these and are essentially the evolution of the E Tanks from the classic Mega Man games. The Sub Tanks are now able to be reused but have to be filled manually. At the end, both of these type of upgrades are welcome and will be helpful during the game. Related to the sound, as it's common with Capcom games and the Mega Man franchise, the game features an excellent soundtrack that will very likely get stuck in your head. It is quite memorable and also good which will set you in the mood for the action of the game or the respective mood in the small story parts. The sound effects are also good, as it matches perfectly what you would expect to hear from the actions that happen in the game. On the graphics part, the game features really nice graphics and simple effects from the SNES. The sprites look really colorful, sharp, and detailed. You can easily see the details in the characters and the backgrounds, which are really well made too and match the style properly. 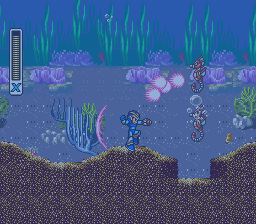 Overall, Mega Man X is a great first game in the new franchise Capcom decided to create. The game is a classic and I recommend it to everyone, and if you are a Mega Man fan or like action games, it's a must get. People who aren't used to this type of games may find some parts difficult, but it's still an overall fun experience.